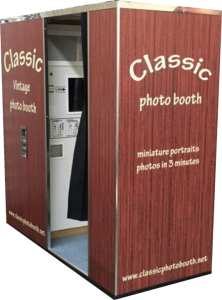 Photo Booth East Coast provide Old Fashioned Classic Booth for rent in NJ, NY, PA areas. The whole new universe of possibilities with our Green Screen photo shoot. Literally, our Green Screen photo shoot can put you in any number of exotic or cinematic locations and has smart placement technology. We can placed the guests in the correct position in front of the green backdrop time after time. Your guests will feel like movie stars as soon as they step onto the red carpet. We can provide a custom step and repeat backdrop with a true red carpet look. In addition, a red carpet and stanchions with red velvet ropes will give your guests a true Hollywood premiere appearance. The company logo can also be added to the prints and our booth can be wrapped with your logo for a complete branding experience. Also a lot of companies have preference to get the vintage photo booths for the events. Many companies engage the services of photo booth services for corporate gatherings, marketing such as product launches and brand activations. Firms then use and give away photos as promotional items such as fridge stickers and magnets. Classic Photo Booth offers vintage photo booth rental in Manhattan, Brooklyn and nearby areas. Also we provide the service in MD, MA, DE, PA areas. Also Classic Photo Booth brings in quality props that have been carefully selected and created. Moreover.